When talking to folks about what they used for collect news to read on their iPad, there was a large percent of the team that wasn’t interested in having news in a feed. Rather, they visit sites, see interesting articles or content and save those to be read later. ReadItLater offers a solution that adds a link in your Web browser. When you come across a article via your desktop or iPad browser you tap the button to save it off for later. Your not saving a bookmark, but rather the full content of the page. The app is Universal so the owners of both an iPad and iPhone only has to buy one copy to use across multiple devices. 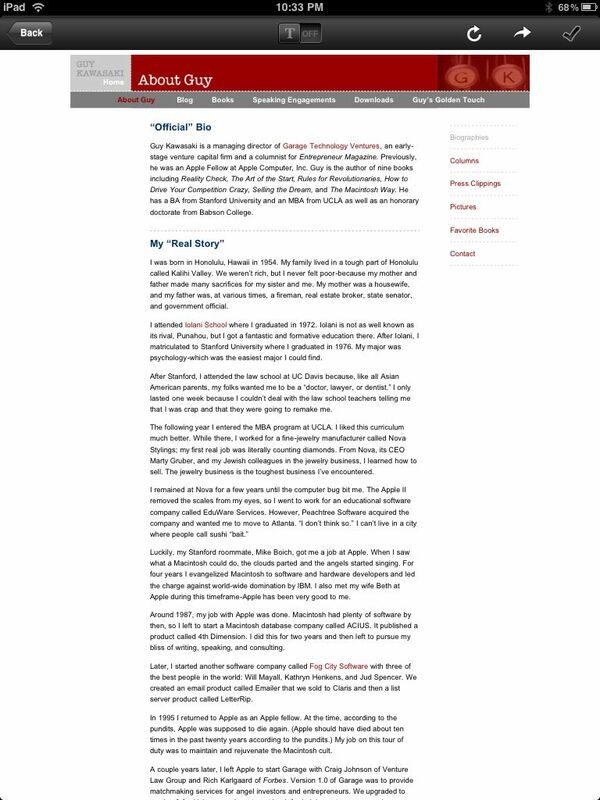 Those articles can be read later via your Web browser or on the iPad via the ReadItLater app. When your iPad is online, you sync to the free service which delivers the Web content in both Text Only and with the full Web site layout. When you read through the content and sync, the exact location in the article is saved so viewing the content from any method will take you to the place you last left off. You can also bookmark places in articles to jump to that spot later. When done with the content, you can keep it in the reader, move to the read/archive area or delete it. Many of us use both systems, Pulse or Reeder AND ReadItLater. We get all of the new posts from a handful of sites as well the particular content we happen across when browsing about the net. Being able to read later is handy for catching up between meetings or when waiting. 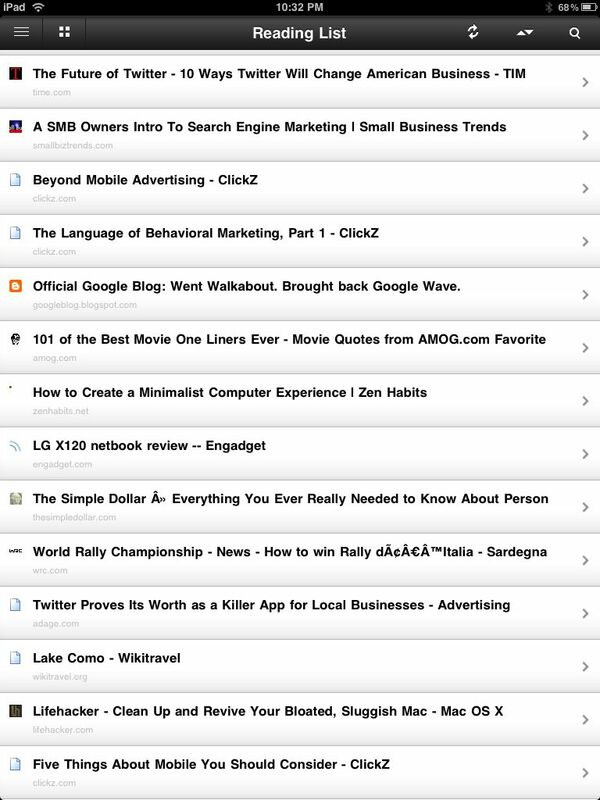 Also great for research gathering… pull down everything you find and sift through to save only what is important later. New to ReadItLater is Digests. These are basically news feeds like the Pulse and Reeder options we mentioned earlier. 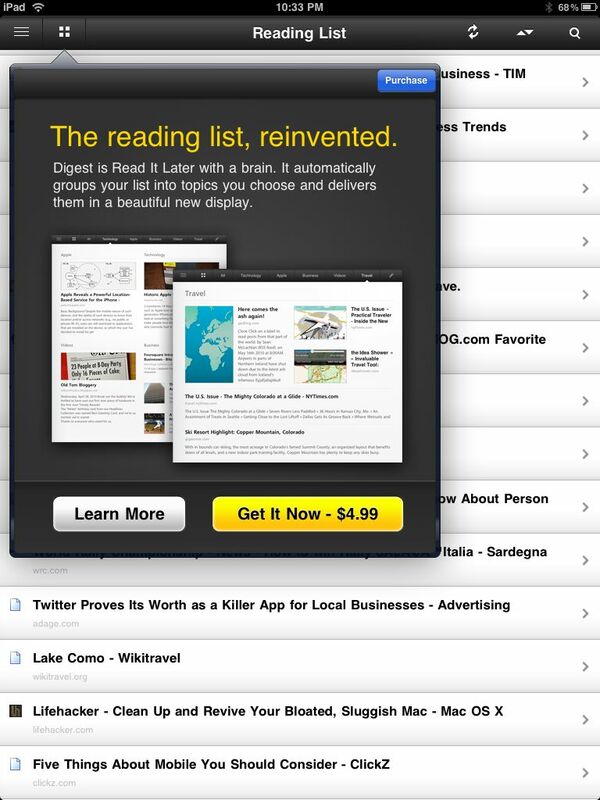 Digests is not a different app from the basic app, it is a in-app up sell for (currently) $4.99. ReadItLater comes in a free and pro version. If you are looking for occasionally using the Save To Read later feature and want that intermixed with your News Feeds, you may want to get the free version and buy Digests from within the app. The Pro version is for you if your wishing to maximize full article content and sharing with others. Reading Web sites when your iPad can’t connect to the Internet.